Excellent value, high-quality sounds - including those single-coil voices - these will sell by the truckload. Good value for money. 57 Classic pickups are excellent. Who's been mucking about with my Les Paul? Gibson has. 2015's annual makeover is one of the most dramatic we can remember. Not only are the Min-ETune 'robot' tuners - improved and rebranded this year as G Force - standard on virtually every model, we also get a height-adjustable brass zero fret and increased neck width. There are no cost-cutting satin finishes, either - it's all gloss nitrocellulose, and there's a new gold-coloured TKL moulded case included with every instrument. There's a slight uplift in price but this Studio might well be the bargain of the 2015 range: a USA Les Paul for £899! 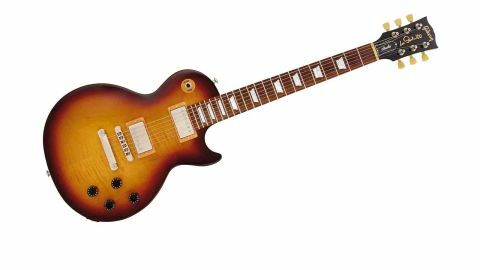 "The Gibson humbuckers have vintage-like clarity and output - ideal for classic-rock tones"
There are a host of subtle changes across the new range. For example, we have the 'slight' body contour, which means the Studio's top isn't as dished as the £2,500 Standard. Do we care? Nope. The very lightly figured maple top is 'B' grade, but in this cool Desert Burst, it looks quite vintage-y, and though we don't get binding, we do get dark cream pickup surrounds and switch collar, and aged-looking satin nickel-plated hardware. We also get modern weight relief, which means it's a chunky-feeling guitar but not overfed. The slim-taper neck is a little odd. The extra width is apparent from the outer strings to the edges of the fingerboard - the string spacing at the nut and the bridge hasn't changed. Initially, it feels wide and a little uncomfortable, especially if you wrap your thumb around the neck; thumb behind, however, once you get playing, it feels rather good. It's the same with the sound. The Gibson humbuckers have vintage-like clarity and output - ideal for classic-rock tones: if you want more power, use your pedals. The 'tuned coil-taps' are handy, giving a pseudo coil-split that sounds very single-coil-like, but without the usual drop in volume. We've left the most 'Marmite' feature till last: the G Force tuners. Firstly, as you'll be aware if you're a guitar geek, hit the tune button, strum the strings and the mechanical tuners whirl. There are four preset banks of dropped, altered and open tunings, although going down to C, the tension gets floppy. Drop D tunings work better, and if you like your open G Keef riffs, or earlier Stones-y open E tuning, both are a push-button or two away. Recording and practising at home, we came to really like the G Force tuners. At a gig, they aren't the easiest to use, although you can tune up the old-fashioned way, albeit a little more slowly due to the high ratio of the tuners. But the more we used the system, the more we felt comfortable. Like the neck. In fact, the more time we spent with this guitar, the more we liked it in general. Love at first sight? No, but it is a grower... so long as you don't have your 'vintage-is-best' blinkers on.